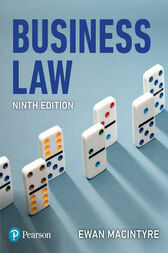 MacIntyre’s Business Law is the foremost text for non-law students seeking an understanding of the legal principles that apply to business. Each chapter begins with a clear outline of the topics to be covered, helping you break your learning down into manageable chunks and fully grasp all aspects of the subject. In addition, the text offers key points to guide your learning and tasks to help you apply what you have learned to business situations. Each chapter ends with a series of multiple-choice questions and a selection of in-depth problem questions. A Lecturer’s Guide, made available to lecturers who adopt the book, provides suggested answers to all of the multiple-choice and problem questions.